On Friday last week Defra announced that Natural England chair Andrew Sells would be standing down in January 2019, a year earlier than had originally been planned. Sells joined the Natural England board in 2014 on his first 3 year stint and I wrote about him back then. During his time at Natural England, the total number of staff working at NE has declined dramatically, as has its operational budget. So while he may have felt he had influence (as an influential Tory) over Natural England’s Defra overlords, he did little to prevent its shrinkage. Would things have been worse under another chair, without the political links Sells has? We will never know. Under Sells Natural England has presided over the Badger cull, which has seen a native mammal slaughtered under the dubious justification of reducing TB in Cattle. While few of us knew Natural England’s role was to protect domestic cattle from disease, we might have expected them to protect wild species and habitats. But the continuing programme to protect our finest wildlife sites, as Sites of Special Scientific Interest (SSSIs) has slumbered under Sells’ watch. At least he was there to support the protection of a few sites, including Rampisham Down, which I was involved with. The fate of Lodge Hill, on the other hand, still lies in the balance, and Natural England have not been able to influence Defra, let alone the Ministry of Housing, to abandon their efforts to destroy this amazing place. And, as Mark Avery has written about exhaustively, Natural England, under Sells, has been craven in its refusal to challenge the damage by Intensive Grouse Shooting in England’s uplands. I wonder whether it is a coincidence that on the same weekend that Sells’ retirement was announced, an article in the Sunday Times revealed that Natural England has issued licences for the culling of Ravens in England. There is already a judicial review underway in Scotland, to challenge Scottish Natural Heritage’s decision to introduce Raven culling. The justification, in as much as there is one, is that Ravens kill or injure newborn lambs. I remember seeing a story a couple of years ago, about sheep farmers in Dorset complaining that Ravens were attacking their lambs and something must be done. Well now, apparently, something is going to be done. Looking a bit more closer, the Sunday Times article quotes a National Sheep Association committee man, Martyn Fletcher, who looks after a sheep flock for a local estate, owned by the aristrocratic Dineley family – who apparently owe their good fortunes (in part) to the manufacturing of weapons for use in the Film industry. Not surprisingly, they support the local Wilton hunt. They also receive £127,000 a year in public subsidies. Some of this is to fund agri-environment schemes, totalling £247,000 over ten years. They also sold off some land to the owners of the Daily Mail, Lord Rothermere, who is, presumably, their neighbour. 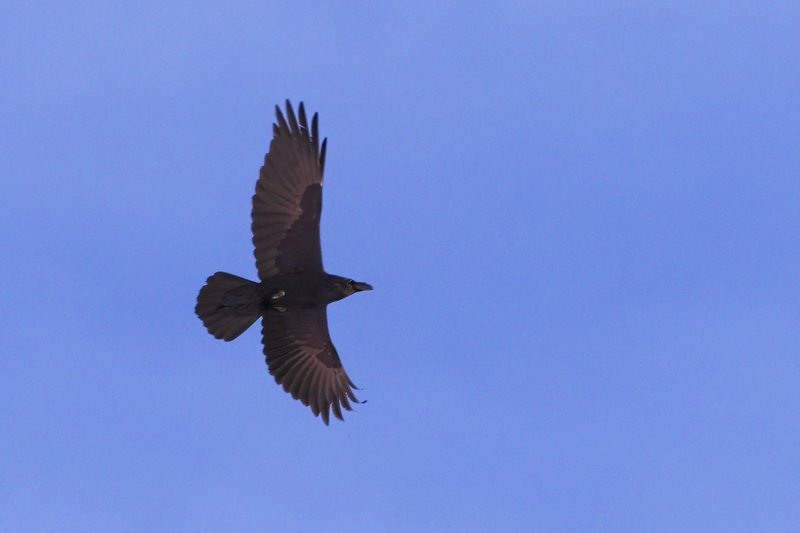 Ravens were persecuted for centuries, and their numbers are slowly starting to increase. Being very long-lived birds this recovery will take a long time. It is always exciting to hear them, when they occasionally fly over the house, or in the countryside. They are inextricably linked to people, and there is a deep-rooted emotional relationship between us – perhaps love/hate is not quite the right phrase, but they both evoke excitement and fear, and always have. For those who don’t know it, here is Poe’s Poem. Once again the question arises – who decides which wild animals are allowed to live alongside ourselves and our farmed animals. There are an estimated 7400 pairs of Ravens in the UK. This compares with 16 million sheep in England alone last year. Farmers receive financial support from the taxpayer, including people like the Dineleys, who I imagine are not short of a bob or two. Is there really no quid pro quo – that in return for that money, some wildlife is allowed to return to the land? Michael Gove has stated time and again that in future farmers and landowners will only receive funding in return for “public goods”. Do those public goods include animals like the Raven (the Beaver, the Otter etc etc), or not? This entry was posted in Andrew Sells, National Sheep Association, Natural England, Ravens, Sheep and tagged Andrew Sells, culling, Natural England, Ravens, Sheep. Bookmark the permalink. 2 Responses to Quoth the Raven: Never More. A point well made. Thank you.